Camp is a big decision. So, of course, you have questions. Here are the ones we hear the most. We suggest you read them all; hopefully the answers will make you feel comfortable. Where is Camp Taconic located? Camp Taconic is located in Western Massachusetts in the small New England town of Hinsdale. The camp is set in the beautiful Berkshire Mountains, on Lake Ashmere. We are just 3 hours from the New York/New Jersey Metropolitan area and 2 hours from Boston. Where do most Taconic campers come from? Last year we welcomed campers from 16 states and 3 foreign countries. Of course, certain areas are represented more heavily since friends tell friends and relatives do the same. Our largest groups come from New York, New Jersey, Massachusetts, Connecticut, Maryland, Pennsylvania and Florida. Is Taconic a uniform camp? No, campers can wear what they like. The only uniform requirements are for our weekly trip days and inter camp tournament games. We do it at our own on-site camp laundry once per week. Is Taconic a competitive camp? 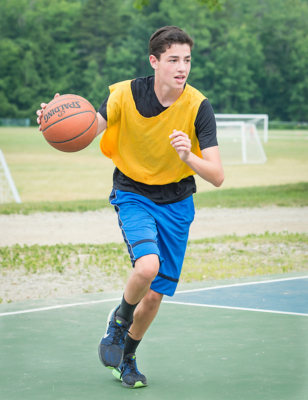 Taconic’s program is designed to enable every camper to feel successful. Our elective program allows campers with diverse interests to grow and learn new skills throughout the summer. We do compete with other camps in many athletic programs and participate in inter-camp tournaments. We also have in-camp sports leagues with well balanced teams created by our professionals. We even invite other camps to join us in our Annual Berkshire County Fair where our campers with artistic interests get to display their best projects. Who will take care of my child if they get sick or injured? Taconic’s health care staff consists of nurses and a pediatrician that cover our health center seven days a week and 24 hours a day. Children receive routine medications according to the documentation on their health history. Local physicians attend to campers who need to see a specialist. In an emergency, Berkshire Medical Center, a satellite hospital of UMASS Medical, is located 15 minutes from camp. Parents are always called when a child stays overnight in the health center, needs to see a specialist or needs to be started on prescription medication. In addition, our campers are checked on arrival and periodically throughout camp by our nursing staff to ensure that hygiene and health is maintained. How do the campers get to camp? The majority of our campers depart on coach buses accompanied by counselors and senior staff members from Westchester County in New York. These buses then travel to Danbury, Connecticut to pick up more campers. An accompanied coach bus is also sent to Natick, Massachusetts to transport our Boston families. We arrange chaperoned flights from Florida. What about phone calls, email and packages? Campers may call their parents at specified times throughout the summer. Each camper is required to write home twice a week and we encourage parents to write often. Emails may also be sent to your camper through our web site. We do not allow care packages to campers. What does Taconic do to ma ke new campers feel comfortable? We host a new camper get together on the first Sunday in May in Tenafly, New Jersey. Small groups of new campers, all the same age, have a chance to meet each other as well as many Taconic staff members. Parents and campers are encouraged to ask questions, participate in activities and to leave feeling raring and ready to go! Once at camp, we match each of our new campers up with a big sister or big brother, a current, older camper. 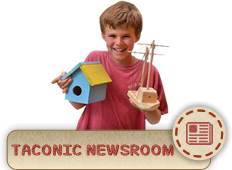 How do I get more information about Camp Taconic? We encourage all new families to meet with a director and make their decision during the summer or fall while space is still available. If you are considering camp for the following summer, we suggest you visit camp while it is in session. We offer private tours and we offer one ‘Rookie Day’. Feel free to contact us if you have questions or would like more information about Camp Taconic!